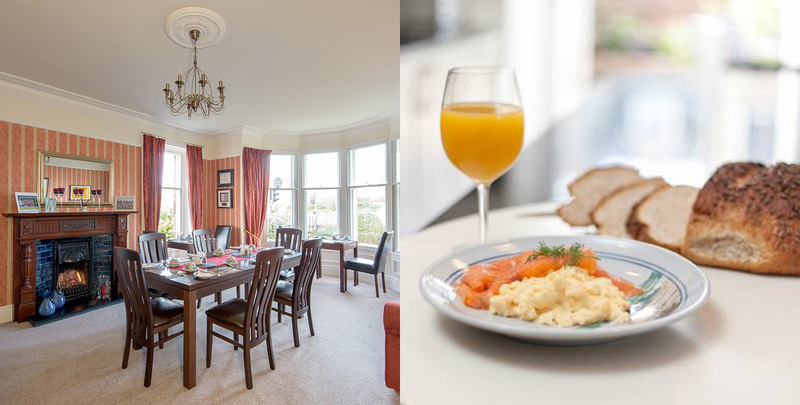 At The Golf Lodge B&B we serve breakfast in the spacious Bay windowed dining room on the ground floor overlooking the garden. Guests are welcome to use this room at any time during their stay free wi-fi available. With an emphasis on quality, we source all of our food from local suppliers. Our breakfast starts off with a selection of Fresh Fruit; Yoghurts; cereals; fruit juice, followed by your choice of freshly prepared cooked food to include Scottish Smoked Salmon,eggs, sausages, bacon, tomatoes, mushrooms, tattie scones, Stornaway black pudding and Haggis if you wish ! For the golfer, why not start the day off with a hearty bowl of porridge before enjoying a full Scottish breakfast ! Dinners can be arranged for groups of 6 or more given prior notice, and served in our dining room or courtyard patio, weather permitting!! Many other dinner options are available, just contact Tom to discuss your preferences. To accompany your dinner you are welcome to supply your own wines, beers, etc, where no corkage charge will apply. Alternatively we can shop for these on your behalf.